The Red Sand Lighthouse is located north of Wilhelmshaven at the height of the island Wangerooge. 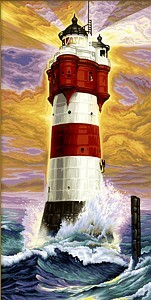 The 28 meter high building was the very first lighthouse in the open sea. From 1885 to 1964 his beacon warned of the shallows in the Weser estuary. Today it is visited by many tourists and is one of the most famous sights of the North Sea islands. Suitable for children over 12 years. Painting made easy! With the "paint-by-numbers method", anyone can paint beautiful pictures by painting all the pre-drawn and numbered areas with colors of the same number.